This was taken right outside my office, and if it wasn't for the crane and street lights in the picture, you might think it was a tropical paradise. It's not. It's smack dab in the middle of the ghetto. I dare say this is a perspective of Mt. Rushmore that you've never seen before. Well, unless you've been there too that is. It's good to have a zoom lens when you encounter a threatened species such as this Desert Tortoise. It was the first one I'd seen in the wild in all my time in the desert. It's a pretty cool species, and I was happy to have finally encountered one. 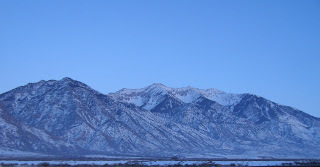 I took this while driving home from Salt Lake City the last time I was there. I miss snow (although, this is probably more of a distance makes the heart grow fonder kind of thing - since I don't have to shovel walks, drive on icy roads, etc.). 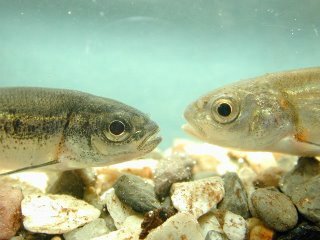 Native Minnow is a doctor, but not the important kind. He is divorced and has three children who live with his ex-wife. Random people take it upon themselves to inform him that he resembles a young Bill Clinton. He does.